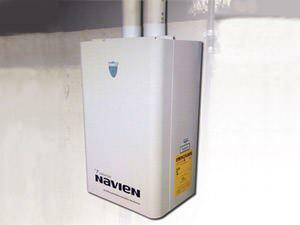 Gas fired tankless water heaters are one of the most efficient options available. If you're looking to upgrade or replace your water heater, it's important to have a good understanding of all the options available. Every type of water heater has pros and cons, from tank capacity to efficiency to fuel source. At Dr. Energy Saver, we can help understand the difference between types of water heaters and choose the right one for your needs. Dr. Energy Saver dealers are skilled in installing all types of water heaters. We can evaluate your current system and recommend what type of water heater will provide the performance and efficiency your home needs. Call us today to get an installation estimate! 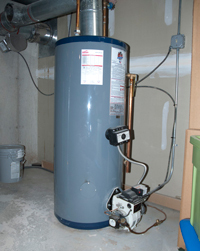 Traditional tank-type water heaters are the most common water heating method. Tank-type water heaters: Tank water heaters have been the standard choice for heating water for many years. The heat source can be electricity, natural gas, propane or fuel oil. Tank-type water heaters have a variety of different capacities, allowing you to choose the right size based on your needs. The downside to these systems is that they are inefficient and can run out of hot water if the demand is greater than the tank size. Heat pump water heaters: A heat pump water heater also qualifies as a tank-type water heater, but a small air-source heat pump provides the primary heat source. Like other heat pumps, this one uses a refrigerant to extract heat from the surrounding air and move it to a heat exchanger, where water heating takes place. A heat pump water heater is about twice as efficient as a standard electric water heater, but it's also more expensive. Because the heat pump will cool the surrounding space, it may not be suitable for use in cold climates where basements and utility rooms need to be kept reasonably warm. Indirect water heaters: An indirect water heater utilizes heat that is supplied by a furnace, boiler, or heat pump. In an immersed coil installation, the hot water tank contains a heat exchanger that is connected to a furnace, boiler, or heat pump. In a tankless coil installation, the water heating coil is located in the furnace or boiler, eliminating the need for a hot water storage tank. An indirect water heater can be very efficient, but this efficiency is tied to the performance of the attached heating appliance. Tankless water heaters: Tankless water heater provide excellent efficiency because of their design. Unlike a tank-style heater that consumes energy heating and re-heating water even when it's not being used, a tankless heater only heats water as needed. Switching to tankess model can cut water heating expenses by as much as 45%. These systems have the ability to modulate and match output capacity to actual hot water demand, but you will need to be sure you have the right type of system to match your home's capacity needs. If you're looking to save money and get better performance from your hot water heater, Dr. Energy Saver can help. We install all types of water heaters, and we'll help you get the right system for your needs. Call us today to get started with an evaluation and estimate for water heater installation in your home.